The seed swap went really well on Sunday 11th at the Dolphin pub. We had a similar footfall to previous years, with around 60 people through the doors over the two hour event. We did have more seeds to give away than usual, due to the efforts of organisers and the generosity of Willowbrook garden centre. They donated slightly out of date seeds, mainly flowers but some veg too. The Heritage seed library also helped us, with lots of vegetable seeds, some helpful veg planning calendars. We had strawberry and flower plants too, as well as the launch of our new foraging map, and collected some new members joining our monthly email newsletter. It was a very successful event, and we look forward to next year- as we always hold it on the 2nd Sunday in February. We would like to thank visitors who brought seeds to swap, and for the generous donations, meaning we raised £94.44, hopefully enough to do a larger print run of the foraging map, available very soon to pick up from the museum. We have also planned a gardening morning, that anyone reading this is welcome to join us. This will be held at 10.30am on Saturday 24th February, at the Bulford herb bed. Simply turn up, with trowel, gloves and kneeler pad if you have them; if you don't you can borrow some. We are going to be weeding the community herb bed,which consists of rosemary, lavender, thyme and chives, and topping up the bark chippings. It shouldn't take too long if we have lots of people to help, so it would be lovely to see you there! If you are unsure on the location, it is at Mount Pleasant, Wellington TA21 8DA, on the corner near the school playing fields. A few photos from the last sewing group get together on Wednesday 6th April. Always a wonderful night spent with a great group of creatively skilled woman. Last week we learnt how to colour natural yarn with vegetable dyes - a simple and fun way to create personalised colours to your knitting or crocheting projects . Every month the Sewing Group gives attendees the opportunity to learn new skills, brush up existing ones or take on a collaborative project like crocheting blankets for the refugees in Calais. If you are interested in attending, you can find out more details by contacting Mary Bradford. 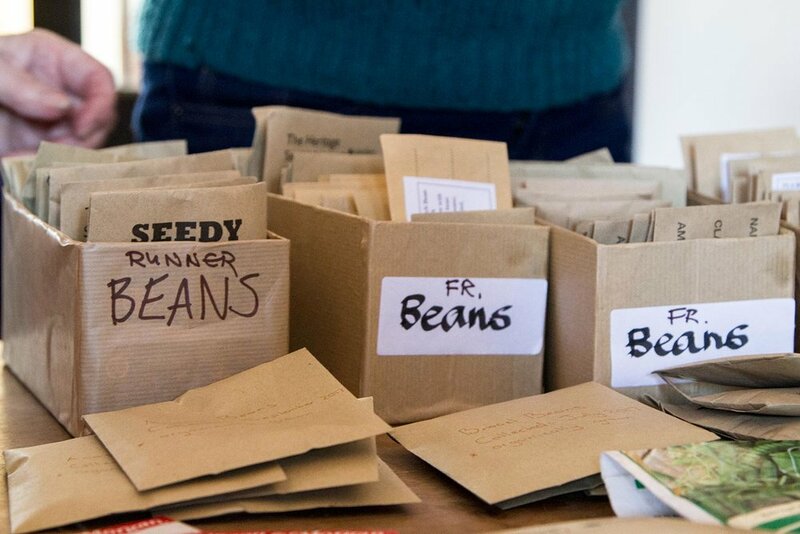 The TTW's third annual seed swap held at the busy Dolphin Pub on Sunday 14th February, was a great success, with lots of people coming along, bringing home gathered seeds, and going home with new varieties to try. There was quite a selection too from the heritage seed library, from many varieties of tomato, including tigrella, (a stripy one), lots of sweet peppers, a blue chilli (! ), flowers, herbs and too many more to mention! As some people did not have seeds to swap, we raised £44 from their generous donations, to help with putting on more workshops on cookery and veg growing. If you would like to learn how to grow organic vegetables, or the seeds you have collected from the seed swap, a series of 4 free talks throughout the year start on Wednesday 24th February, 6.30-8pm at the Methodist church. Everyone is welcome from the very beginner to the more experienced gardener. Leftover seeds from Sunday will also be available to collect at the veg talk. It is free to attend, although the written notes are £1. We would like to encourage everyone to experience the joy and reward of growing things, so we hope to see you there! On Sunday 14th February, the Transition Town Wellington successfully planted 12 morello cherry trees at the edge of the 2nd rugby pitch, with 8 new people coming to help plant them too! By 2017 they will be producing sour cherries to use in cherry pies and jam, and we will encourage local people to come and harvest them, with recipes showing how to cook them on our website ttw.org.uk. They will also have beautiful blossom in the spring which you should be able see from the sports centre steps in the years to come. If you would like to join in with more tree planting this week, we will be meeting at 10.30am on Sunday 21st February, at the community woodland, which is accessed from behind the sports centre, or from the 2nd rugby pitch. There we will be planting 8 different types of fruit for people to enjoy the harvest from in the future. Just bring wellies, maybe gardening gloves if you have them, and young children must be accompanied by an adult. The Transition Town Wellington has been running a project to plant edible trees and bushes in community spaces in Wellington. This is to help increase the sustainability of our local food production, and to make unused spaces more productive and beautiful. We have so far planted an orchard at trinity church and some currant and rhubarb bushes near the Bowles club. Now with the support of the town council, we will be planting a cherry grove and some more currant bushes at the 2nd rugby pitch. The fruit will be available for all the residents Wellington to pick in the future. The sun came out finally on Sunday 7th Feb for our tidy up of the 2nd rugby pitch. We cleared lots of brambles in preparation for the planting of the cherry grove next weekend. It looked like a big job, but with 11 people on hand, we managed to cut and remove the brambles in 2 1/2 hours. You are invited to come and help plant the trees and bushes on Sunday 14th at 10.30 am, we will demonstrate how to plant them, and provide tools, all you need to bring is wellies and some gardening gloves if you have them. It should be fun, and you will be able to see the tree you planted grow over the years. Children are welcome, but responsible adults need to come with young children please. So I hope to see you next week, Sunday 14th February at 10.30am, at the 2nd rugby pitch, near the park! The Transition Town Wellington continued our community project by planting another fruit bed near the Bowles club in Wellington. Last year we planted gooseberries, redcurrants and blackcurrants, and although the plants are still quite small, they produced enough fruit for some passers-by to pick in 2015. As these plants grow bigger there will be more to pick! On Sunday 17th January, the TTW's sustainable food group planted rhubarb next to the first bed. This needs one year to get established before it can be harvested, and should be ready for the public to pick from 2017. We want to show how ground that is otherwise wasted can be used to produce a useful food crop, helping Wellington become more sustainable in its food production. If you know of any areas you feel could be used for similar purposes around where you live, or would like to help plant more fruit trees and bushes around Wellington please get in touch. The TTW's Sustainable Food Group held another successful event on Saturday 28th November- to make your own Christmas! It was very well attended with over 50 people in the Methodist church function hall, and well organised too, with different activities and demonstrations flowing throughout the afternoon to keep everyone amused. The children enjoyed making sweets and chocolates, and there was lots of yummy mince pies and stollen made, to feed all the mums, dads and grandparents too! Keeping up the traditional crafts, gingerbread men for the tree and dried orange decorations would brighten up the tree, and so many wreaths were made, you are sure to see more on doors this year! We all enjoyed being part of this community event, the next one is the Seed Swap on Sunday 14th February, 2-4pm at the Dolphin pub. Everyone is welcome, either to swap seeds, or to take some for a small donation. Hopefully we can all do our bit to reduce the amount of things imported, and for Wellington to be more sustainable, so why not come along and try growing some veg next year! The chutney day, hosted by the sustainable food group, part of transition town Wellington, was a great success this year. 14 people came to the Methodist church to chop fruit and vegetables as a community, and we made 12 different chutneys! We used mostly home grown veg and apples provided by volunteers. It's fun to make chutney as a group, plus, rather than having lots of jars of the same chutney, everyone got different types! Chutney is really easy to make, we provided recipes so everyone can make their favourite at home, and if you do make too much of the same type, it makes an excellent, and inexpensive, Christmas present! Transition Town Wellington had a really busy day on Sunday 8 February. First of all planting community fruit bushes in the morning,outside the Bowls Club on Corams Lane in Wellington. We planted a bed of blackcurrant and gooseberry bushes. Having obtained permission from both the council and the Bowls Club, we hope this bed, on the way to the sports centre, will be well used by the public. We want to show how ground that is otherwise wasted can be used to produce a useful food crop, helping Wellington become more sustainable in its food production. If you know of any areas you feel could be used for similar purposes around where you live, please get in touch by calling Kate on 01823667170. If you fancy some fruit for your crumble pudding, just help yourself in June, before the birds get it! We held a seed swap at the Dolphin pub - a great success, with around 60 people dropping in! Many seeds were brought, from flowers and lots of vegetables, including some heritage varieties. There were also seed potatoes and flower plants, plus full grown bare root apple trees on sale from a local grower.Children made wild flower seed bombs, to be thrown in the next few weeks to increase native flower diversity. Lots of fun was had> TTW would like to thank everyone who attended and helped us to raise £73 for the Transition Town fund, to help us to put on many more events like this in the future. Chocolate truffles, mince pies, peppermint creams, iced gingerbread and dried orange tree decorations were just some of the goodies made at Transition Town Wellington food group's Christmas food and decoration day. The event, which took place in the Methodist Church hall in Waterloo Road, aimed to show that making traditional Christmas food and decorations is cheap, fun, environmentally friendly and a great opportunity to get together with neighbours and friends. The weather could not have been better for Transition Town Wellington’s annual Apple Juicing Day, held this year at Swains Lane Nature Reserve, on Saturday October 4. Over thirty people of all ages took part in the event, which included a picnic and live music. Val Mister, a member of the TTW Food Group, said: “I was able to bring my two grandsons with me, and they got really involved with the process and thoroughly enjoyed themselves, as did all the other children who came. The whole event was a great success, and helped to raise awareness among local people of the existence of the Reserve and Community Orchard.